MSC offers several different options to suit the needs of any level tennis player. Players can choose to reserve court time on an hourly basis or they can choose to improve their tennis skills in a group setting. For those customers looking to lock in their preferred day and time for the entire season we offer 36-week Season Courts (with or without a pro). Season Courts are courts rented by an individual or group for an entire season. A Season Court will guarantee you a definite time to play - your court is reserved on the same day, at the same time each week. For more information on our Tennis Season Court Options, click here. Monroe Sports Center offers instructional programs for competitive tournament players as well as players just starting to play. Players can begin playing tennis as young as 4 years old. No matter what your level is (Beginner, Intermediate, Advanced) - we will find a clinic that is right for you! Season Courts are bought by members who pay to have a certain court day/time reserved every week. They pay at the beginning of the season and they "own" that court time every week. Season courts can be reserved by an individual, family or group and will include a pro on the court (if desired). Clinics are group lessons taught by a pro that run for 12 weeks. Our clinic ratio is 6:1 (4:1 for 10 & Under). Members often take clinics in conjuction with their Season Court for maximum results in their tennis game. Members of a clinic have the option of converting their clinic to a Season Court. Members and non-members not looking to make a long-term commitment but want to take more than one private lesson may purchase a special one-time lesson package. This package includes 5 hours of lessons with one of our tennis pros. Rates include the court time and pro fees, both of which should be paid directly to MSC. Costs will vary based on pro. Lesson specials may be used my multiple players. For example, if 2 players each pay $200 for Package A for a total of $400, they may take 5 semi-private lessons together. Players can reserve court time on an hourly basis. Open Court Time may be reserved up to one week in advance. No shows will be charged the hourly rate unless cancellation is made at least 24 hours in advance of the reserved starting time. Call today for rates and to book an open court. Season Courts are bought by members who pay to have a certain court day/time reserved every week. They pay at the beginning of the season and they "own" that court time every week. Open Court Time is bought by customers who just want to play now and then. It is paid for at the time of booking and customers check in with the front desk attendant when they arrive. Junior Walk-on: A junior member that has joined one our programs and paid the membership fee is entitled to a special walk-on rate of $10/hour. Customers may call MSC to see when there are open courts for walk-on time, but walk-on time may not be reserved in advance. The $10 walk-on rate applies if all players on the court are junior members. It also applies if a junior member is playing with an immediate family member. Adult/Senior Walk-on: An adult or senior member that has joined one our programs and paid the membership fee is entitled to a special walk-on rate of $20/hour. Customers may call MSC to see when there are open courts for walk-on time, but walk-on time may not be reserved in advance. The $20 walk-on rate applies if all players on the court are members. Additional fees will apply if non-members are on the court. All customers that sign up for one of our tennis programs (season courts, season group lessons, season private lessons, leagues, clinics, etc.) must pay a membership fee. Membership privileges include cheaper open court time rates and junior member walk-on time rates. It also grants customers access to our club tournaments and special events. 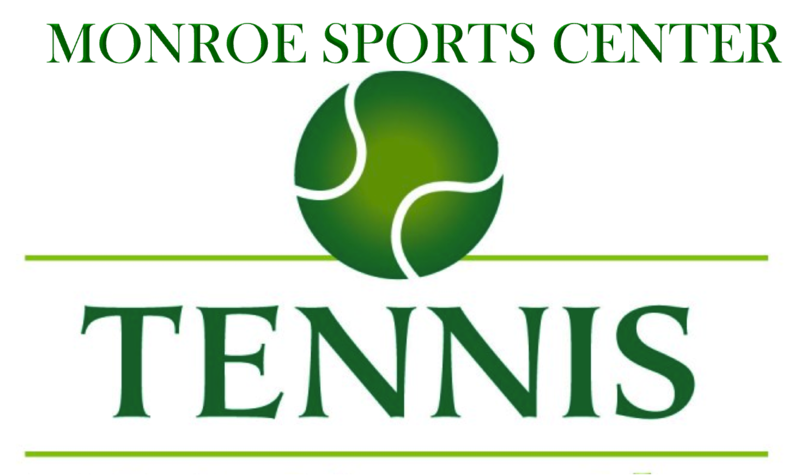 All junior members will receive a Monroe Sports Center Tennis T-shirt.